Rolls-Royce partners Nanyang Polytechnic for VR experience « Tech bytes for tea? From June 2017, this initiative will be extended to other showrooms in Asia Pacific. Rolls-Royce Motor Cars and Nanyang Polytechnic unveiled two winning immersive VR video clips at the super-luxury brand’s showroom in Singapore. More details of the partnership can be found in the press release below. 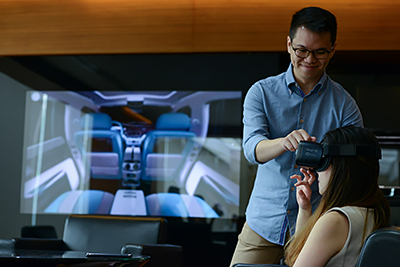 Singapore, 12 April 2017 – For the first time, Rolls-Royce Motor Cars customers will be able to immerse themselves in a Virtual Reality (VR) experience for their Bespoke programme – thanks to impressive work by Nanyang Polytechnic (NYP) students. “Rolls-Royce Motor Cars’ commitment to this project is another example of how the company deeply values the nurturing of young talent, in parallel with The House of Rolls-Royce in the UK, where our apprenticeship programme is now larger than ever, ensuring that our dedication to handmade quality and craftsmanship continues beyond the current generation. We are also staying ahead of the curve in the super-luxury industry by partnering with some of the brightest young minds in this country to present our Bespoke capabilities in a new, unique way, as well as supporting innovative, emerging talent in VR,” says Paul Harris, Asia Pacific Regional Director for Rolls-Royce Motor Cars, on the collaboration. The super-luxury brand chose to partner with NYP in a first-of-its-kind collaboration with an Institute of Higher Learning in Singapore. Nine groups of students from NYP’s School of Interactive & Digital Media (SIDM) were invited to create a simulated world that offered potential customers a glimpse of Rolls-Royce’s signature Bespoke service through immersive 360-degree motion graphics videos. These videos are now brought to life using Samsung’s Galaxy Gear VR headsets in the showroom. While all nine teams from SIDM’s Diploma in Motion Graphics & Broadcast Design and Diploma in Visual Effects created strong concepts, an independent judging committee comprising Rolls-Royce and VR industry executives finally selected two of the most outstanding VR experiences to showcase to the super luxury brand’s customers in Singapore. Rolls-Royce Motor Cars supported the project by offsetting software and licensing costs. Winning team members also received an Apple iPad each. The winning VR videos introduce the endless possibilities for Rolls-Royce customers to create personal touches on their cars. 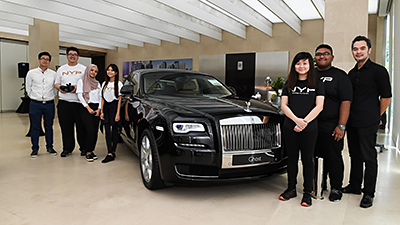 “We are pleased that Rolls-Royce Motor Cars chose to work with Nanyang Polytechnic. This has been a symbiotic project. The team from Rolls-Royce worked closely with our staff to mentor and guide the students towards the exceptional work produced. Our students had a chance to spend time with the cars and were impressed by the company’s dedication to detail and design. The professionalism and commitment from all parties in this collaboration is commendable,” says Daniel Tan, Director of SIDM at Nanyang Polytechnic. This entry was posted on Wednesday, April 12th, 2017 at 3:00 pm and is filed under Accessories, Announce, App, audioVisual, Automobile, Business IT, Education, Entertainment, Events, events, Gadgets, gadgets, Launch, Lifestyle, newArrivals, Press Release, Rolls-Royce, Shopping, Software, virtual reality (VR). You can follow any responses to this entry through the RSS 2.0 feed. You can leave a response, or trackback from your own site.